I decided to try using painters tape to mark the quilting line for some straight line quilting a la Jacquie Gehring…she does this when she wants really straight lines. I usually mark the lines with a Fonds and Porter graphite pencil. I have never had any trouble with it washing out but I hated to use it all over this white sashing. It also doesn’t show up well on black. 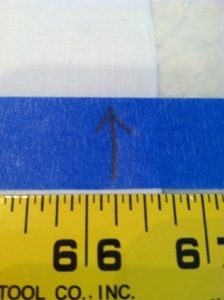 I marked the side of the tape I needed to sew. 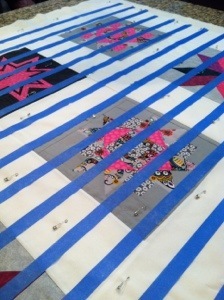 This keeps the space between the two tape lines the same across the quilt. This entry was posted in Uncategorized and tagged Jacquie Gering, Modern Quilt Guild, Modern Quilting, Modern Quilts. Bookmark the permalink.